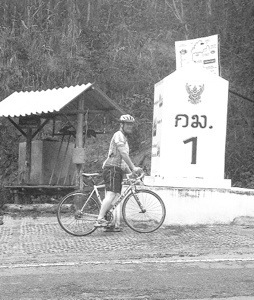 When we returned the Trek 7.2s Spice Roads threw out the idea of a road bike expedition; 120km circuit of the mountains, 2900 Baht (£60) – cross selling to be commended, but not afforded. It made me think though; we could rent road bikes for a third of the price (800 Baht) and plan our own ride; wasn’t that what we were in this for anyway? 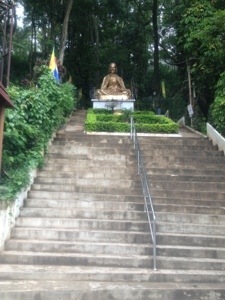 Having studied the area, the most simple route was straight to the top of Doi Suthep. Doi, meaning mountain, it is part of the southern most range of the Shan Highland system (thank you Wikipedia, I will be sure to donate later). 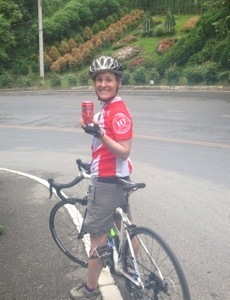 At 1676m it is not the highest (Doi Ithanon stands at 2565m) but hey, we are not heroes. Doi Suthep would do and there was some ‘wattage’ (Wat Phra That), great views and a Royal Palace to tick off the tourist list. We heeded our lessons and set off early. With no breakfast (the hotel did not offer it so no feat of will power on our part) we shuffled out to the car park, lycra’d from head to foot, armed with pump, inner tube and my back wheel. Yes, sure enough, having taken the bike from Spice Roads HQ at 16:30 the previous evening, my rear tyre was flat before 17:30. It should have been funny, I mean, this was number six, but it happened on the way to the train station, in rush hour and the only thing that rivalled the ferociousness of the traffic was my temper. I was disappointed, having pictured myself zipping through the early evening traffic, svelte and easy as an eel. What is it they say about vanity or pride? The only zipping I was doing was my purse after I had paid the songthaew driver his 100 Baht to deliver two humans and two bikes back to the old city. Anyway, leaving the hotel without breakfast proved to be more of a problem than we knew. As we cycled the perplexing ring road, passing monks collecting alms, I began to think of food – don’t ask me why, it wasn’t the monks, it is just never far from my mind. Nor does it take much to interest Nick in food, so soon we were scanning the side walk for stalls and shops. Nick pointed as we rolled; there were stalls set up at the side of the road, on them were packages of rice, pieces of fruit and cartons of drink. We agreed that they looked like breakfasts and at the same time, I think we both had a lingering doubt. We stayed indecisive until the road bore right and clearly began to climb; it looked like our last chance. On the shoulder of the bend there was what I can only describe as ‘activity’. It was a junction where stalls had been erected, and despite the early hour, there were people beginning to mill. Among them were monks. I waved impatiently for Nick to stop, and I waited with the bikes in front of a large monument while he went to investigate. Meantime I was approached by a man who claimed to be an artist. He had little remaining of his front teeth, but he looked no older than I am. When he asked where I was from he said ‘John Sargent,’ and I briefly thought he was telling me his name. He told me he taught children to draw and could make a portrait in three minutes. I was sure he was angling for some kind of business, although I could not figure out what. And then Nick burst back. ‘F*$king monk!’ I was horrified. Nick rarely loses his temper but he was bitching about a holy man of Thailand in front on another (probably not so holy) man of Thailand. Nick forced another ‘F’ from between his teeth. ‘Stole my f*@king breakfast!’ I told you, Nick likes his food. As if by magic, but more likely conjured with a nod, a moped sped up taking ‘John Sargent’ away and Nick told me his story. He had asked the lady stall-holder (who now languishes in the sub-basement realms with the squid lady) for one of the packages on the stall. She handed it to him and asked that he give her 30 Baht. He was confused by the silver dish that held the food but gave over the money. And as if moulded of the very particles around him, a monk came to life, holding out his hands. Nick was confused. The woman gestured that he should give his breakfast to the monk. The monk made encouraging noises. Nick was angry. The lady and the monk continued to gesture. Nick tried to protest. Their gestures became more intense. In the end he gave it up, unable to escape the tableau he found himself in without causing significant cultural upset and incurring some pretty negative karma. ‘But it was my breakfast!’ He whined like a child. I threw Nick’s gloves at him and suggested we move before he became the cause of civil unrest. As the road climbed, Nick chuntered. I was disappointed, I was hungry. But we had to face it, there was a sated monk somewhere, counting his alms and gorged on our ignorance. The climb was a slow grind. We stopped at several points; to breathe, drink, enjoy the view. It was early morning and the road was peaceful. Of the traffic that did pass, some vehicles were mini vans or songthaew bearing tourists from Chiang Mai. At the view points they spilled out, captured the the city (as much as they could through the mist) and each other, stretching and posturing across it, and then they all crammed back in. While I was pink and sweaty, I didn’t envy them, I enjoyed the freedom to stay as long as we wished and the satisfaction that we had done it ourselves. At the wat we paused briefly, for water, Red Fanta and freshly chopped pineapple, before pushing upward toward the palace. I shouldn’t tell you this, you might think it failure: but we never made it. After the wat the road became steeper. Bearable, just, but we were travelling less than walking pace and we could see no respite. We pushed on until we saw the dogs. We heard them first, their barks ringing down the deserted road. As we rounded a corner we saw them, maybe five (Nick says more), strung out across the road, sniffing, interested in nothing in particular. Until they saw us. We paused, watched and waited. And they watched and waited. And then they moved toward us. The decision to abort was made quickly, with barely more than a look. There was not another soul on the road. If we kept going we would have to cycle straight through the dogs and we could barely keep the bikes balanced on the steep gradient, let alone out-cycle a territorial pack. So we turned. And then all we had to do, after over two hours of climbing, was roll all the way to the bottom. We stopped before the wat, both of us a little choked with our, er?…choking? But it was the right decision. Those dogs, loping down the hill toward us, they were the manifestation of a fear that had haunted both of us for weeks. The dogs would have smelt it. Call it running away, but it was better to enjoy the descent we had worked so hard for with all our limbs intact. 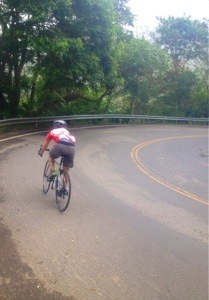 On the way down we passed road bikes, mountain bikes, shirtless guys, runners, mini-vans, songthaew, mopeds. It sure is a well-worn path, but it was all the better for making our own.